If your yard is looking a little lackluster or suffers from soil shifting and flooding problems, one way you can spruce it up and retain soil composure is by adding a retaining wall. A retaining wall is a crucial aspect of hardscaping in Show Low, AZ. It holds or retains soil behind it to maintain a landscaping feature. Retaining walls can be build out of a number of materials, including concrete, brick, blocks, rocks or even wood. This makes them great aesthetic additions to the surrounding landscape. However, retaining walls need to be constructed carefully in order to maintain their structure and look. If you have a sloped lawn, it can be difficult to mow or plant things on it. Many homeowners build retaining walls in their sloped front or back yards to prevent soil erosion, minimize flooding risks or create new gardening spaces. Through the installation of a retaining wall, you can maximize the space you have to utilize your yard and patio while also having space to grow plants. Hardscaping in Show Low, AZ doesn’t have to be one-size-fits-all. You can change the color, design and material used for your retaining wall to help it blend in with the rest of your outdoor space. 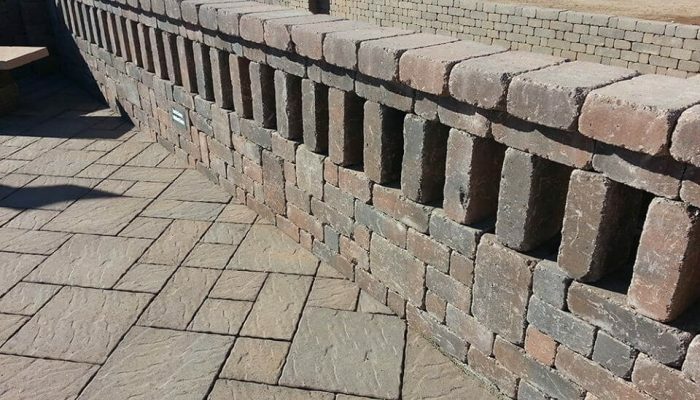 Retaining walls are highly customizable for the best-looking yard in town. Adding retaining walls can turn your boring, flat garden into an interesting, eye-catching one. Retaining walls are one of the most popular hardscaping features because they act as a garden centerpiece. Careful consideration must go into building a retaining wall. This is because retaining walls will be subject to immense pressure from soil, roots and water over time. If they are not constructed properly, they can topple, leaving your yard a mess and your garden ruined. You should first determine what will be held behind the retaining wall. What type of soil do you have, and what will you plant in it? Is there a large structure like a pool on the same level as the retaining wall being constructed? These questions will help you decide what kind of wall you need, what reinforcement structure to use and how high the wall will be. Also consider the slope of your hill and how difficult it will be to build a wall against. Next, you need to plan for a solid base. Trenches for the wall, as well as backfill and compacted soil, need to be added to ensure the base of the wall does not shift. Your wall should also be designed with gravity in mind. You will also need to consider drainage. Many retaining walls have drainage pipes to assist with the removal of water from one level to another, reducing the stress put on the wall. Building a retaining wall is hard work, and without expert knowledge, you could cause a mess in your yard that will take years to repair. Instead, call Tim’s Landscape Creations for hardscaping in Show Low, AZ. We offer a variety of services for residential and commercial landscape design and installation. Contact us today to learn more!